Panasonic HDC-TM700 camcorders add 1080p60 or 1080p50 progressive recording mode (depending on region) by using a proprietary variation of the AVCHD format. If you record videos in the interlacing mode like 1080/60i and 1080/50i with Panasonic TM700, the videos shall work on Mac, but you may sometimes face the unexpected lines when playing them on Mac. While viewing videos on camcorder, you may find the videos perform perfectly with smooth playback. However, when you put them on computer, you may notice that there are unexpected lines on the videos, especially when there is quick movement. The computer monitor does not like the 1080p camcorder videos. One solution is to get media players that support deinterlacing video when playing, e.g. VLC media player. How to deinterlace Panasonic HDC-TM700 1080p MTS videos? To play on Mac computer, MTS is not a good choice although VLC player can play MTS. But it really need much power of the computer. If no enough good configuration, you will get choppy, stutter or even lag issue when enjoying these 1920X1080 MTS files. iFunia AVCHD Converter for Mac is the perfect Panasonic AVCHD converter on Mac to make the 1080p MTS videos playable and editable on Mac computer. The Mac Panasonic AVCHD converter does not only convert MTS to H.264 MOV for QuickTime Player, but also deinterlaces the HD 1920x1080 videos by removing the interlacing artifacts. Step 1. Load Panasonic videos to iFunia AVCHD Converter for Mac. After connecting Panasonic HDC-TM700 to the Mac computer, run iFunia AVCHD Converter for Mac and click the Media Browser icon at the upper right corner to load Panasonic HDC-TM700 .mts videos. 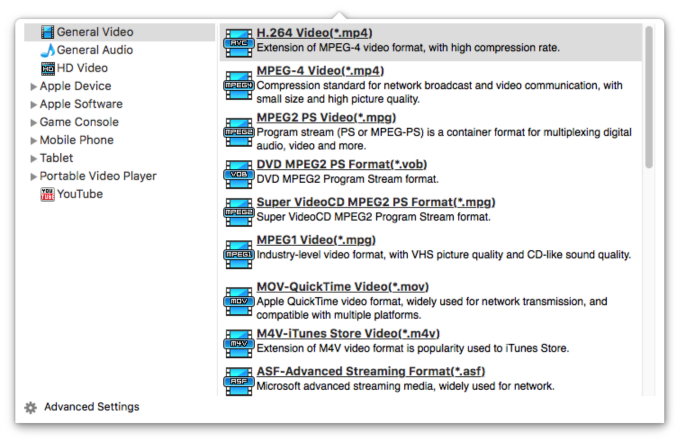 Batch AVCHD video files are allowed to loaded. Tip: If you have multiple Panasonic HDC-TM700 MTS/M2TS files, you can select the “Merge” box at the bottom of the app to merge the files into one single file so that you can play these files without interruption. Select a clip on the file list, and click the edit icon and you are allowed to do some editing here, like cropping unwanted parts and trimming video length. In the "Deinterlace" section, tick the checkbox of "Enable Deinterlace" and interlacing 1080i footage can be removed perfectly. At the right side of "Output Format", you can select the output format from the down-list, just select your need format or match your device format, e.g. "MOV - Quicktime(*.mov)". Step 4. Convert Panasonic HDC-TM700 MTS to MOV for QuickTime. Hit the conversion button, this will instruct the program to convert Panasonic 1080/60i MTS to MOV for QuickTime on Mac for smooth playback. After the conversion, just play the HD videos like other quicktime file, and enjoy with iMac large screen.